At Linhart Dentistry, we have three dental lasers. 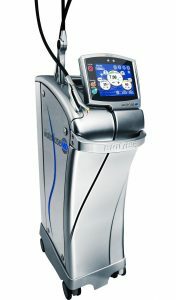 The Biolase Waterlase Express and Waterlase MD, as well as a YAG laser. This technology gives us treatment options unavailable to those without lasers. Waterlase dentistry uses a patented technology combining laser energy and a spray of water to perform a wide range of dental procedures on teeth, gum, and bone more comfortably. Lasers have long been the standard of care for many medical procedures, and the Waterlase system was approved for use in 1998. Since then millions of patients from around the world have benefited from Waterlase dentistry because of less need for shots, anesthesia, drills, and post-op numbness. 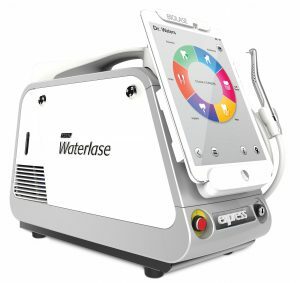 The Biolase® Waterlase MD and Express lasers allows us to perform multiple important dental procedures such as anesthetic free fillings, gingivectomy, gingival recountouring, hard and soft tissue crown lengthening, lesion removal, frenectomies, de-pigmentation, and much more! Heat, vibration, and pressure are the primary causes of pain associated with the use of the traditional drill. Since the Waterlase does not generate heat, vibration, and pressure, many dental procedures at Dr. Linhart’s office can now be performed with fewer shots, less anesthesia, and fewer numb lips! Waterlase cavity preparations can increase bond strength of tooth-colored restorations resulting in longer-lasting fillings! Due to its conservative and gentle cutting action, the Waterlase performs many gum procedures with little or no bleeding and less post-op swelling. Since you often do need shots or anesthesia with Waterlase, Dr. Linhart will be able to perform cavity preps in all areas of your mouth in just one visit! The Waterlase allows Dr. Linhart to remove tooth enamel decay, bone, and gum tissue precisely, while leaving surrounding areas unaffected. This conserves and allows you to keep more of the healthy tooth structure!